Keeping a clear perspective can be difficult at the best of times, so it is no wonder that every needs a hand once in a while. 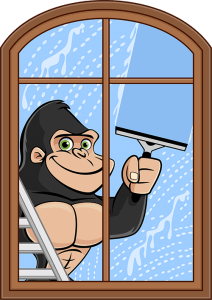 Now, our Gorilla technicians can’t give you any insight into the larger questions of life but we can help clear up your view with our Burlington window cleaning. Don’t let spots or streaks ruin the outlook of your home or business! Windows in Canada have to put up with a lot! Changing temperatures are one thing, but let’s face it – our climates can be complicated. You might wake up with a cool breeze and sunshine, but end up with torrential rains. It is easy enough to run inside and hide out from storms, your windows are left out in the cold. These windows might seem sturdy enough but they are under constant attack and without a bit of help, they won’t last long! Routine maintenance goes a long way to helping you make the most out of the lifespan of your windows. Sticking to a schedule can be tough but our Gorillas are here to help keep you on track. With the right tools, the right methods and the right attitude, your home or business will look better than ever. Tackling spots, streaks, dirt and stains can be tricky. It is tough to know which cleaner is right for your windows, and how to approach which problems. Luckily, our Gorilla technicians are highly-trained and experienced. We’ve seen it all and we know how to take care of business at every level. Cleaning off the surface of windows takes more than just a spray and a wipe down. Instead of focusing solely on the glass itself, our Burlington window cleaning covers sills and frames as well. 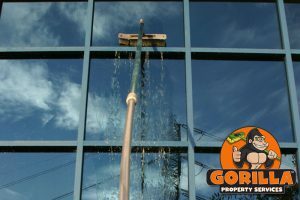 For those areas that we can reach with our paws, our Gorillas combine rubber squeegees with eco-friendly cleaning agents to remove marks and eliminate static cling on glass.